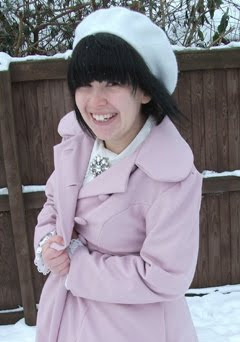 I decided to try out my coat in the snow!I don't usually do pictures like this but then we don't usually have snow like this. I didn't know if my coat would be warm enough, but it was fine. My main problem was lack of appropriate footwear. I do actually have some very warm gloves and boots but they are both black and I didn't want to spoil the look. They do match my hair better though! 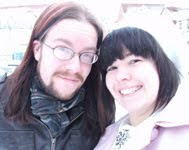 Thanks to my lovely fiance for being my photographer and standing out in the cold while I messed about. Model: me (with chilly feet) Photo man: Fiance Clothes: Beret & Brooch - Primark, Coat - made by me, Blouse - Baby, Skirt - made by me, Tights - bargain from TK Maxx, Shoes - one of those replica places. This is one of the books I got for Christmas. Although it's called Couture Sewing Techniques I actually found it a great introduction to the idea of couture in general. For example, did you know that Haute Couture garments are pretty much all hand sewn? That really made me think. I always assumed you needed a machine to make clothes properly but you would actually have a lot more control sewing by hand. 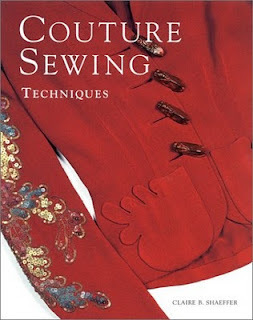 The book explains the process that couture houses go through to fit clothes for each client - usually making a totally new pattern to flatter the individual figure! Then the author shows lots of useful techniques starting with hand sewing stitches and going on to different hems, bindings and fastenings. I thought one of the most useful sections was about facings and backings and how they are used to keep the item in shape. This isn't really mentioned in most sewing technique books apart from a little bit about interfacing. It does feel a little old-fashioned in places. Mainly I imagine because couture is now such a small industry most of the examples are historical and a lot of the clothes shown are kinda ugly not so inspirational. I do like that this book has been written with home sewers in mind though. Everything is explained and there are photographs and diagrams where required. It's easy to see where you would be able to apply the techniques to your own work - even if it's not totally hand sewn.